WCF Service is a program that exposes a collection of Endpoints. Each Endpoint is a portal for communicating with the world. All the WCF communications are take place through end point. End point consists of three components. Transport -Defines the base protocol to be used like HTTP, Named Pipes, TCP, and MSMQ are some type of protocols. Encoding (Optional) - Three types of encoding are available-Text, Binary, or Message Transmission Optimization Mechanism (MTOM). MTOM is an interoperable message format that allows the effective transmission of attachments or large messages (greater than 64K). The following table gives some list of protocols supported by WCF binding. Collection of operation that specifies what the endpoint will communicate with outside world. Usually name of the Interface will be mentioned in the Contract, so the client application will be aware of the operations which are exposed to the client. 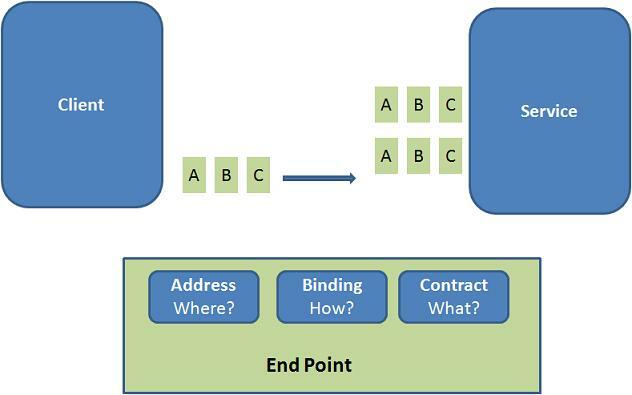 Each operation is a simple exchange pattern such as one-way, duplex and request/reply. Endpoints will be mentioned in the web.config file on the created service.